Christie’s London announces highlights of the forthcoming Important Jewels auction on 3 June 2015. The sale features an impressive display of both antique and modern jewellery, signed pieces by the great houses such as Bulgari, Cartier, Dior, Graff, Tiffany and Van Cleef & Arpels, together with some exceptional coloured stones and diamonds. The sale comprises 395 lots and is expected to achieve in excess of £7 million. One of the most outstanding piece in the sale is a superb 1960s emerald and diamond suite, by Bulgari (estimate: £250,000-300,000). A Superb Emerald and Diamond Suite, by Bulgari. Bulgari jewels of the 1960s are typified by their bold use of vibrant colour in conjunction with an extensive employment of stones cut en cabochon, specifcally in principal positions and most innovatively using precious rather than semi-precious stones. 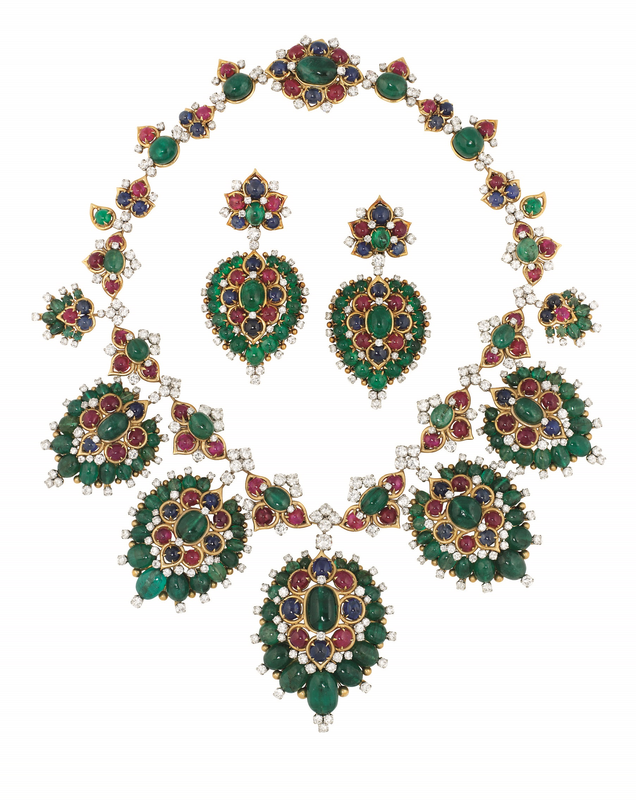 Furthermore, as illustrated by this suite, during this period Bulgari returned again and again to a more compact rounded shield form, employed frequently in brooches, pendants and earrings often in combination with the bib necklace. This suite is a quintessential example of the best of Bulgari. Cartier will be represented in this sale by over 60 creations, encapsulating the broad spectrum of design of this great jewellery Maison; among these creations are eight iconic ‘Panthere’ and tiger jewels, each capturing the essence of these famous Cartier motifs in their sleek and alluring form. With collectors’ ever-increasing demand for high quality natural pearls, Christie’s London will offer an excellent selection of natural pearls in a variety of shapes and designs. The sale features also a number of private collections with rare jewels of high importance and a broad selection of stones in a variety of cuts and colours, including a Burma ruby of 8 carats and a Burma sapphire of 28 carats, both with no indication of thermal treatment. Here below is a Ruby and Diamond ring, featuring a cushion shape ruby weighing approximately 8.04 carats, claw-set between stepped baguette-cut diamond three-stone shoulders, raised on a polished hoop. (Estimate £100,000-150,000). The ring is pictured together with a Natural Pearl and Diamond ring, with a large bouton shaped natural pearl centre measuring approximately 14.2 x 13.2mm, to a channel-set square and baguette-cut diamond collar gallery and similarly-set tapering shoulders, raised on a polished hoop. (Estimate £40,000-60,000). One of the most fascinating jewels ever created, the “Zip Necklace” by Van Cleef & Arpels, will be present in this one-of-a-kind pink sapphire and diamonds version. Modelled as a zip, pavé-set with pink sapphires in various shades interspersed with brilliant-cut diamonds and calibre-cut pink sapphires sliding toggle with similarly set tassel drop. The impressive sapphire below is of rectangular cut-cornered shape, and weighs approximately 28.15 carats. Flanked by shield shaped fancy-cut diamond shoulders, it raises on a polished hoop (Estimate £200,000-300,000). There is a continued demand for Art Deco jewels, which celebrate the creative flair and geometric design of the period. This sale represents the Art Deco style with a stunning array of examples by the leading houses and designers. The demand for historic jewellery with provenance continues undiminished, with collectors around the world competing for these fragments of history. Magnificent pieces of antique jewellery at a wide range of estimates feature in this sale; amongst which a magnificent 19th century sapphire and diamond parure from the collection of a royal house and a striking peridot riviere; as wearable today as it was at its inception over 100 years ago. This Edwardian emerald and diamond suite comprising a choker necklace, designed as a graduated millegrain-set old-cut diamond repeating loop motif openwork panel, each with an oval or square-cut emerald highlight centre, between diamond line borders; together with a circular brooch/pendant of similar design, the central cushion shaped emerald, within a double border of millegrain-set old-cut diamonds, to a radiating knife bar surround and outer emerald and diamond-set laurel wreath frame, suspending a further emerald and diamond drop and diamond swag suspension, circa 1905. This amazing ruby and diamond necklace is property of Her Royal Highness the Princess of Bavaria. Of collar design, it is composed of nine cushion shaped ruby and brilliant-cut diamond clusters, joined by marquise, pear and brilliant-cut diamond spacers, to a diamond line back chain, suspending a similarly-set detachable ruby and diamond drop pendant. This impressive 19th century sapphire and diamond necklace is accompanied by a tiara and a corsage ornament. The ensemble comprises a fringe necklace of graduated sapphire and old-cut diamond clusters joined by diamond floral and foliate connections, suspending a series of sapphire and old-cut diamond drops, mounted in silver and gold, circa 1830, clasp circa 1860, 41.5cm long. The necklace goes together with a tiara designed as a spray of old-cut diamond dog roses, with cushion shaped sapphire centres and buds, among diamond-set foliage, and a corsage ornament of similar design, mounted in silver and gold, circa 1860 with later alterations. Post edited by Claudia Carletti, Jewellery Through Time. All material courtesy of Christie’s London.